Concrete safety and security bollards can offer a high level of functionality yet still maintain a design aesthetic appeal. The precision use of horizontal and vertical reveal lines make for an appealing modern landscape accent. Natural structural integrity and resiliency of precast concrete is reinforced with 1/4" and 3/8" steel rebar maximizing the bollards performance and longevity ready for demanding conditions. 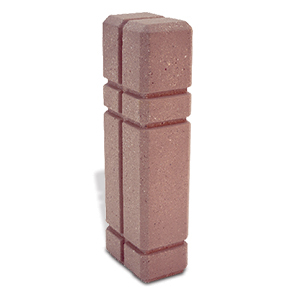 This ASTM compliant concrete bollard is available in select standard and premium finishes.